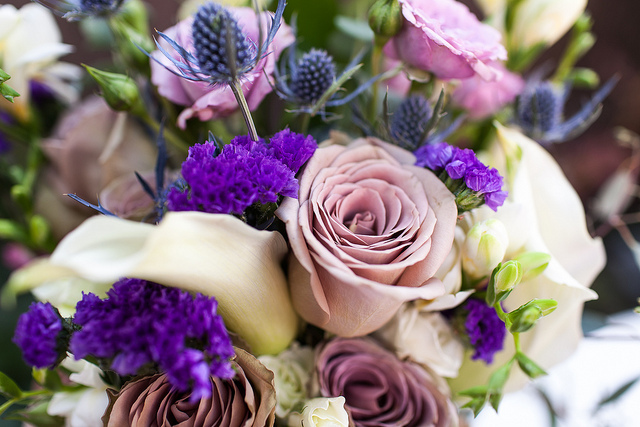 Purple wedding bouquets look stunning against a wedding dress, the color pops and if you are having purple as your wedding color there is a great deal of choice when you want to find the perfect shade. Carnations – love this flower as it is relatively cheap nearly all year round and they are so hardy, your bouquet will look great all day. Calla lillies If you want your wedding flowers to look dramatic you could have a single purple Calla Lilly with ribbon wrapped around the stem it will look stunning. 3 Calla lilies will look even more wow and may feel like more of a bouquet. Chrysanthemums – thankfully they have lost their old fashioned reputation as they are a great flower and another one that will look great all day. Clematis – dramatic and delicate is how I would describe this flower! You would need more robust flowers included in a bouquet with these. Cone flowers are so natural looking, perfect for a country wedding. Crocus – only in the Spring and this may be more a flower for your bridemaids or flower girls as the stems are quite short. Freesias – love freesias, they have such a beautiful perfume but they are also quite delicate so you would need other flowers in your bouquet. Gladiolis – if you are looking for a tall flower with a lot of wow factor this is the one for you. So gorgeous that I doubt you would need much else with it. Gerbera daisies are a classic and great for weddings as the flowers will look great all day, the stems go floppy so you will need to wire the stems to make them look fab. Hyacinths are not a popular flower for bouquets, I see them most as part of a centerpiece but they are big and bushy so you wouldn’t need many. Hydrangeas are also relatively inexpensive during the summer months and since they are so large you won’t need many flowers to make a substantial bouquet. Irises are lovely and tall and a deep dark purple – they look stunning alone and also as part of a mixed bouquet. Impatiens are very natural looking flowers, almost daisy like, so would be good for a country themed or barn wedding. Lilacs – cute flowers and will last well through the day. Lupins – big flowers that look stunning. Pansies look great but are a small stemmed and delicate flower, perfect for a Spring wedding. Peonis are such a popular wedding flower that they can be very expensive, if you do find a a relatively inexpensive supplier you are in luck. There are however other flowers that will look just as stunning at a fraction of the cost. Definitely worth looking at carnations as a cheaper alternative to a rounded flower. Roses are a classic wedding flower and purple roses will be more expensive than pink or white as there is not as much choice and it would be rare to find purple roses at somewhere like Walmarts. 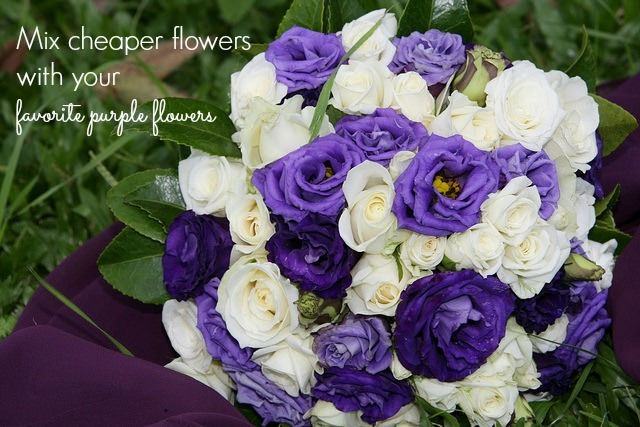 If you want roses in your bouquet you could have white roses to save money and compliment other cheaper purple flowers. Sweet peas, not my favorite flower as they make me sneeze so much, however the look great and if don’t have anyone in your wedding party with a pollen allergy you should be ok! Tulips One of my favorite purple flowers are tulips which are a great price in the Spring, however be careful when it comes to choosing tulips as they can get droopy really easily especially if your venue is hot. One way round that is to have your tulip bouquet tied quite high on the stems, that way you are not giving them a chance to droop. Of course you don’t have to have real purple flowers there are lots of gorgeous looking artificial flowers that would look stunning and could end up saving you money overall. 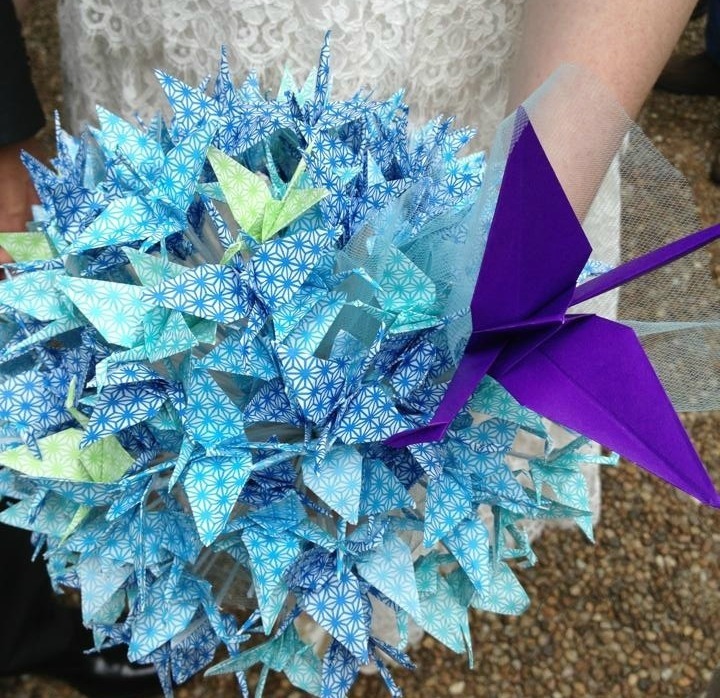 Also how about making your own bouquet with either paper flowers, brooches or maybe the art of origami?